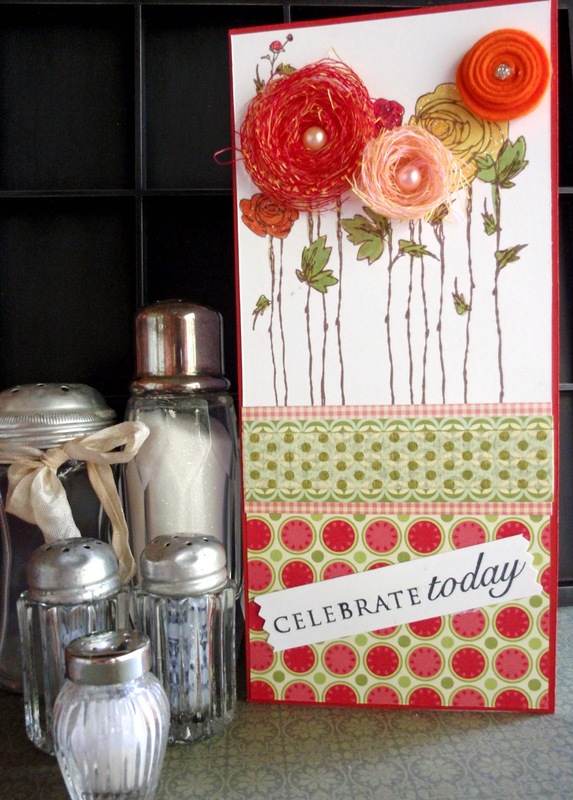 Created 4 Creativity : Celebrate Today! Even though it's Monday....we should celebrate today. Don't you think? Today's card is the last in my Stampendous series. I had tried out for their current design team and these last four cards were my entries. I was not selected - but they promise to keep those of us not chosen on their radar. So maybe next time! I had a great time using these Stampendous stamps. They are wood mounted and stamp up so clearly. The only die on I used on this card was for the smaller orange rolled flower. I have shown it to you before and it is made by MFT Stamps. I made the other flowers by twisting course fibers onto a chipboard circle which was covered in hot glue. A little tricky - but it worked. I added a gem to the center of each flower because flowers are prettier with gems in the middle. I will be back tomorrow to show you another project using dies. After all The Dies Have It !